Performance Automatic presents our new “Smart Packs”. 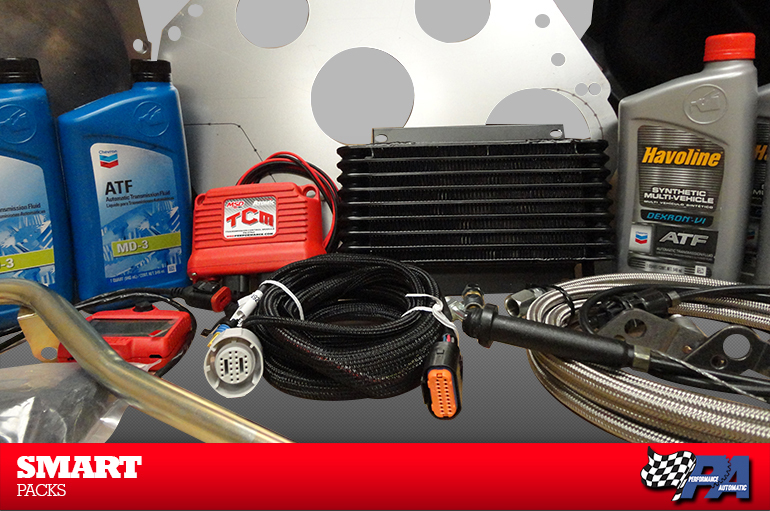 “All the stuff you need when you need it!” We have Smart Packs for the Ford C4, AOD, AODE and 4R70W and for the GM 350,400, 700R4, 4L60E and 4L80E transmissions. Each Smart Pack is transmission specific, so the parts you get are the parts that will fit your application. All Smart Packs include; hardware, block plate or dust cover, dipstick and filler tube, trans mount and a trans cooler kit with braided steel lines. Depending on your trans, you may also receive a TV cable, shift linkage or vacuum lines. Smart Packs for all the electronic transmissions come complete with the Atomic Trans Controller and wiring harness. The Smart Packs are designed to work with any make transmission, no matter where it comes from. Every Smart Pack comes in one easy to order box with all the parts and pieces you need to finish your project, even an installation guide and a case of AFT formulated for each transmission! Smart Pack, just add your transmission and converter, and you’re done.